The Kalampatzom water system first stage was completed in 2008 which consisted of a 3140 meter conduction line connecting a spring box to a 5 cubic meter distribution tank. The project will serve about 54 families presently and an anticipated 80 to100 families in 20 years. Two provisional pipe lines of small diameter will be constructed to serve two sectors of the village with one water station each. We will be installing a pellet chlorination system before the tank to allow the village the option of chlorinating the system should they decide to do so or if they have a health problem in the village. The village of Kalampatzom has 54 families. About 12 of these are presently living on the village site that was abandoned during the civil war. 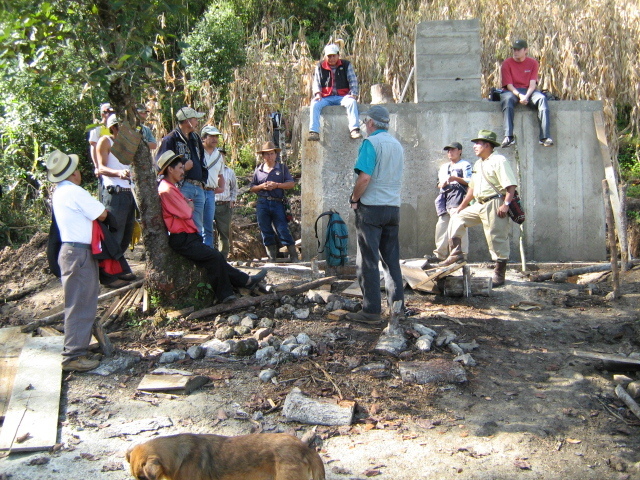 The balance of the villagers have plans toreturn to the site when the water system is complete. Most of these villagers are now living in a near by village Janlay. The children of the Kalampatzom families are presently going to school in Janlay adjacent to the project site. APS is presently seeking funds from Water For People to augment this project with latrines for each house site. The community of Kalampatzom is located at a direct line distance of 15 kilometers northwest of Nebaj. It is approximately 230 kilometers from Guatemala City in the Cuchumatan Mountains, in the Guatemalan central Highlands. It is about 2000 meters above sea level. The village is approximately 30 minutes by road from Nebaj. All of the villages in the area were destroyed in the early 1980's as a result of a campaign by the army to defeat the guerilla resistance movement. As a result of this campaign, all structures, houses, water systems, animals, orchards and crops were destroyed. The villagers from Kalampatzom were forced to move to Nebaj and had their houses burned. At the moment, the community is not totally restructured, but 10 families already came back to live on their fields. About forty other families come daily to work on their land. These 50 families need to walk two hours a day in order to get to the land they work. The village has a school building that was constructed by the government for these families and is shared with the neighboring community of Janlay. It includes about 160 children. Peerwater is presently funding by a separate project the improvement of water facilities in the Janlay school. Men’s primary occupation is agriculture. As for the women, it is house-keeping. 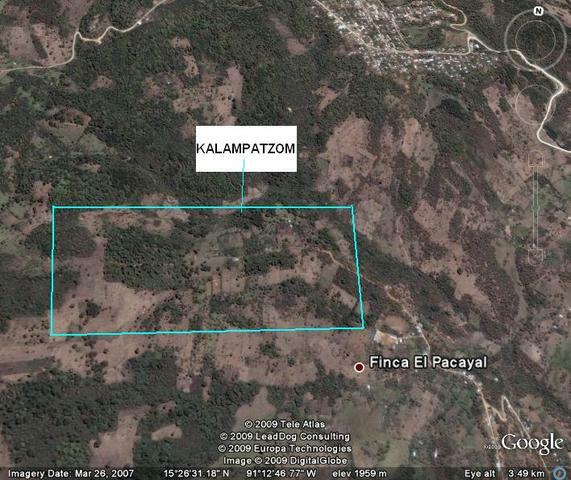 The area around Kalampatzom is considered to be cold land and only supports one crop a year. Most of the crops obtained from their land are used to feed their families, but very often it is not enough to cover the whole year. As a result of this crop shortfall, many of the men or even the entire families migrate to the warmer south coastal areas of Guatemala to find seasonal work with the sugar cane and coffee plantations. The incidence of water-related diseases and other illnesses is high, especially during the rainy season. For medical attendance, the villagers of the area must walk between 20 to 40 minutes to Janlay or two hours to Nebaj to visit a nurse. Recently, Cuban doctors and medical technicians have been visiting the area providing a better level of health care. The projects consists primarily of pcv tubing with galavanized 1/2" faucet standpipes at each house. A small concrete pad is included in the project on which the home owner can locate their wash station. The concrete pad has a 3" drain to a soak away pit of three meters covered with double layer treated wood cover and the pit is protected by a barbed wire fence with four trees planted at the corner posts. Pisture is included in the proposal documents. The first phase has been completed as mentioned in the proposal. This project is the second stage. 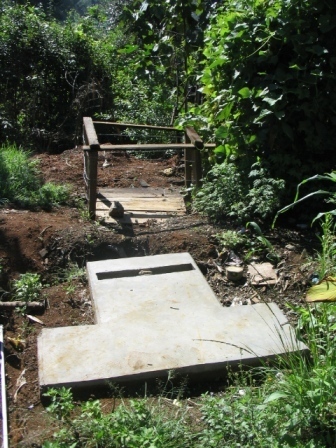 A third stage is contemplated if funds are available in the future for the construction of latrines. A contract is signed outlining the community responsibilities and the responsibilities of APS. All members of the village sign the agreement. The APS supervisor and the village committee organize the village for the duration of the project. Several members of the village are selected to work the entire duration of the project to train them in the instalation and amintenance of the system. The village is required by the contract to determine a fee for water. The project serves the long term goals of the Guatemalan government to provide water to each family ; provide for confinement of human feces; and delivery of health education. a poster of good and bad hygiene habits. The northern part of Quiche Department is consisdered by the Guatemalan government as one of the poorest areas in the country. As such the villagers have very few resources other than pysical labor to contribute to the project. The villagers have agreed to provide local materials from their land such as wood for conctere forms, rocks for ballast, and a contingency fund for the project amounting to 10% of the material costs. This fund if not used will become the basis for a water system maintenance program. The village will use funds remaining to start a fund for maintaining the water system the terms of which will be included in the contract with the village prior to construction. Funds are being solicited for a latrine project in the village. The community will contribute non skilled labor, coordination, and local materials such as wood and rock. AGUA PARA LA SALUD (APS) is a local non-governmental organization, based in Nebaj, in the department of Quiché. It was founded in 1994. The organization’s activities include the provision of drinking water supplies, and health and hygiene education. It operates in rural villages where there is no existing water infrastructure, and levels of water related diseases are high. The office is composed of a director, Lynn Roberts, SAFAD and other volunteers, and five field staff. 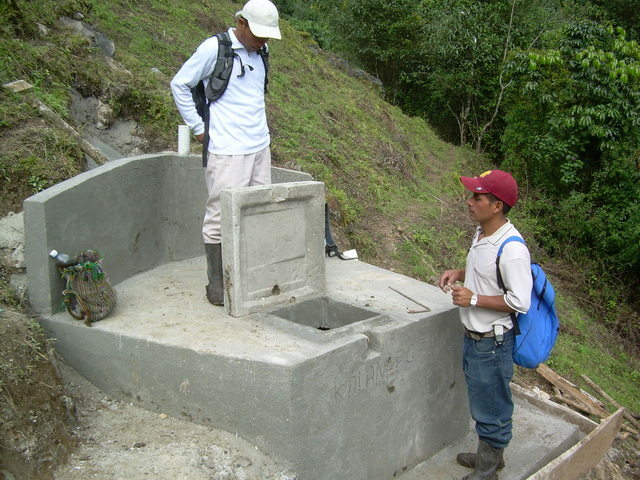 Lynn also supervises water projects in other areas of Guatemala with Peace Corps and other funding agencies..
1. Application # 169 – the status of the Chuche School Hygiene Project is listed as ‘complete-successful’: is it possible to see some pictures? There is no report submitted or is it an error for the start and end dates are same. 2. Application # 108 - Extension-PULAY WATER SYSTEM the record shows that the project was completed in 15 days. The final report is missing. It would be helpful to see some pictures showing people are using water from the extended pulay water system. 3. Application # 167 -Janlay School Hygiene Project and # 172 - Kanaquil School Hygiene Project – it would be helpful if some progress reports are uploaded with pictures. The project reports for #169 and #167 are pending the completion of the final project in Janlay school which should be complete by the end of August. Thes projects were part of a six school project in which three have been funded. I have inclosed in the original application for th Pulay Water System Extension #108 two additional photos of typical water connections in homes. We are presently seeking funding for a second phase of the Pulay Water Project which will include improvements to the distribution system and connections at the homes. A picture of the repairs to an old existing spring box inspection port and sanitary seal is included in the original proposal. I had completely overlooked the need for a final report on the extension. I will correct this situation and file a report. The basic project was to repair 4 other small spring boxes that the village was holding in reserve for the future. The spring boxes were poorly made and did not have overflows to facilitate cleaning and overflow if needed. Three of the spring boxes did not have proper sanitary lid seals to prevent contamination. All of these defects were repaired during the extension of the project. Gilles Corcos of Agua Para La Vida. It looks like in many ways your approach to these gravity systems is similar to ours. -I note from your picture that the water stand is a 1/2" galvanized pipe, (perhaps with some kind of estaco) then an elbow to a faucet. That may be adequate but to prevent over energetic pigs or other projectiles to damage the (same) pipe we sink it in a concrete column that is poured in 4" pipe. - On the distribution system how do you regulate the flow rate of each faucet beyond choosing the pipe diameters as well as you can? We make systematic use of orifices ( little 1/2 metal diaphragms with a small hole of variable diameter in the center) these are buried a short distance upstream of the fawcet. They can be made locally and fit conveniently in pvc unions. They complement the choice of pipe diameters (since you can't choose a diameter smaller than1/2 "). Our distribution design tool, Neatwork then specifies the distribution of pipe diameters between tank and each pipe stand as well as ideal or available orifice diameters. If you provided me with the topography of your distribution system, the desired average flow rate per faucet, your faucet type and the maximum number of faucets that you estimate should be used in the same time I'll be glad to run Neatwork to predict the sizing of pipes and orifices wherever needed and to predict the detailed behaviour of the system under this design, as well as predict the behaviour of your system under your design. I can do that in very little time and it might be fun. I have attached a design of the household connection we use to the original application foryour review. In the design there is a 1/8" hole drilled in one of the valves to regulate the flow. We use this uniformly and have not had complaints from the locals about the flow. Under normal circumstances this allows each owner the ability to fill a 10 liter container in less than a minute. Attached to the original proposal are the hydraulics and schematics if you wish to insert this info in your program. It would be interesting to see the results. Thanks for the effort. We also did several long studies of the peak factor in this area and found that only about 30- 35% of taps are on at any given time during the day. Using this information we size our tubing systems accordingly to save on instalation costs. I know this is not important but still thought as correct info in future. 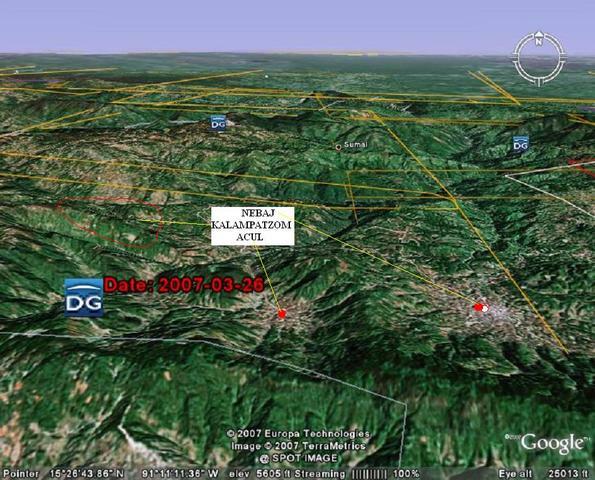 According to the map that you had sent via email and coordinates at the bottom of the page after conversion and re-plotting kalampatzom shows 7 km, direct line, north west of Nebaj. 91	12	46.77	-91.212992	7 km NW of nebaj. Just from curiosity, what are the other sources of drinking water availale in the neighboring towns like in Finca El Pacayal? Do they have potable water? 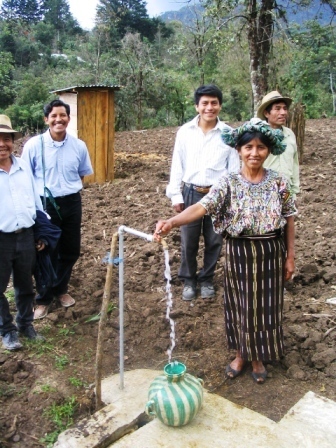 The majority of the villages in the Ixil area have water supplies coming from spring sources. If fact the name "Nebaj" means "place of springs" in the Ixil language. We have installed rain catchment projects in a few very high villages that do not have springs above their villages. We are also considering a couple of villages for pumping projects that have springs below their villages. According to the budget the lifetime cost per person is $108 if the total expense is considered as 29,000 for 270 people of which the administration cost is >50% of the budget. The maintenance cost of such water system that includes pipes and taps is only $1 as per the proposal. That definitely needs attention. It is important to spend at least five years of monitoring until the users develop a sense of dependency on the clean water and give more importance and care so that they will be willing to pay for the repairs and become self reliant whether through the local government or themselves all of which needs follow up program. Will any organization be involved in monitoring? Maintenance of water systems as developed by local custom is a mixed affair. The primary motivation for the type of maintenance by the villagers is based on two factors. The first is their trust in their villages committees to safely handle funds and the second is the ability of villagers to tie up funds that they need to feed their families. This decision to repair and maintain is made by concensus in a village meeting. Since water is a critical part of daily life the villagers have for the last 15 years found a means to maintain their water systems under these factors. They have been very good at dealing with water problems when they occur. We have provided constant technical assistance during this time period and assist the villagers with finding a source of funds if the repair is too costly for their village resources. We have found that the villagers are capable of solving these problems within their cultural framework without imposing outside concepts of maintenance. The govenment simply is not active in this area and leave the topic entirely up to the villages , which is by default a motivation for the villagers to take responsibility for their water systems. Recently 35 of the 50 villages in the municipality of Nebaj have joined together to form a legal association to deal with a variety of common village problems and seek funding for these projects. They have done this entirely on their own without prompting from outside entities. Populations at risk do have the resources to solve their problems independently if they organize. Once the motivation presents an initiative such as this it is a good indication that it will be sucessful and sustainable and we certainly intend to encourage the effort. 1.The project primarily consists laying of PCV tubing (pipes). Can you please explain more details about the PCV pipes (specification and cost per feet / meter of 1 to 2 inch and 1 ½ inch etc? 2.I understand from the budget sheet that the communities contribution in the form of labour is 12500 $ i.e equivalent to 2500 mandays that works out to 5 $ per manday. If it is so, then the wage labour rate is in comparison to our rural area i.e. 3 to 4 types more. Whether there is difference between the local wage labour and the Govt daily wage rate? This is just to understand and compare with our situation. 3.The total cost of the project including the cost of people’s contribution, excluding the management cost of 8011 $ works out to 21289 $. The management cost works out to 38% which seems to be higher? 4.Looking at the material cost specially galvanised items i.e. elbow couplings gate valves, adaptor, tee reducer etc.are comparatively very high as compared to our prices. Whether all these material is imported or manufactured in the country? How much does one cement bag of 100 pounds cost? This is just for my curiorisity just to compare the situation in India and at your country. 1) The costs for the pvc tubing is listed in the material list in the original proposal if you would like to compare costs. Tubing comes in 6 meter lengths and in this project will be 160 psi or schedule 40. The conversion rate is Q8 to $1.00. The material list is converted at this rate of exchange. 2)The legal minimum daily wage in Guatemala is about Q40 or $5.00 per day depending on agricultural or office work and the project uses these figures to calculate the village contribution. 3) If you re-visit the monthly costs of the project you will see that the labor for the project is included in the admin. costs. If you seperate the labor out of the admin. then admin. expences are $4096.00 or 24.4% of the project. This is typical for our projects for the last 15 years. 4) The costs of all of the materials are listed in the local currency ( Quetzales) and must be divided by 8 to get dollars. We normally get two to three bids for materials before making a purchase. We normally specify US made brass valves and faucets to ensure high quality for these items that are in service and use by villagers since we have found that using any other valves will mean more replacement in the future. The balance of the materials are from local manufacturers that probably import some of their stock. 1. ‘The community of Kalampatzom is located at a direct line distance of 15 kilometers northwest of Nebaj’. Is this town Nebaj is also known as Santa Maria Nebaj? If so then Kalampatzom is located South of Nebaj or Nebaj is located northwest of Kalampatzom. Unless I am misunderstanding that the community that once lived in kalampatzom is now temporarily living northewest of Nebaj. Please clarify? Meera the village of Kalampatzom is located in the municipality of Santa Maria Nebaj department of Quiche. IT is NW of Santa Maria Nebaj and located within walking distance of the village of Pulay where many of the villagers from Kalampatzom are now living since they do not have a water system on the land that they abandoned during the civil war of the 1980's. I have attached a GOOGLE EARTH map to the original proposal for you view. Hi Lynn, i am sending the map via email that was plotted using the geocodes provided in the proposal.Thanks for your response. 1. Is the water from a spring? What do you mean by ‘Spring box’? 2. If it is spring water then there is possibility of presence of toxic minerals. Was the spring water tested for any such mineral? 3. Good to see that chlorinators are used in your projects (pulay project) but in this project chlorine pellets will be kept as an option to be chosen by the villagers. Since there is prevalence of Gastro-Intestinal/Diarrheal (final report of pulay project) diseases it is advisable to continue chlorination and also it is seen that contamination is very common at the point of use (house) so the posters and education on practice of personal hygiene and sanitation is crucial. Are the household pipes running underground or over-ground? How come the maintenance cost is so low? What about normal wear and tear and cost of chlorine pellets who would pay for them? Yes the water is from a spring site. We use the term "spring box" to describe the concrete structure used to capture the spring and connect the spring by conduction line to the distribution tank. The tubing we install is all buried at 80cm and where it is above ground or passing over rivers and streams it is galvanized pipe. The majority of the villages have a collection system to maintain a fund for repairs. There is resistance in the area to collect such funds because of poverty. Most families are in severe economic stress and are reluctant to place money in funds that could be used to feed their families. Most families make financial decisions on a day to day basis depending on family needs that day. honored if the family is hungry. The water in this area is area is free of toxic minerals according to the HACH chemical tests we have done in the field. The water in the area is generally in good condition since it comes from water shed in the hign mountains where minimal population is present. We have been monitoring the water of about 40 villages in this for the last 8 years. About 35% of the spring sites show presence of potentially harmful bacteria sometimes on a seasonal basis due to the rainy season. For this reason we have been installing chlorinators on all of our water systems for the last three years. We are ahead of the local authorities , Area De Salud" (ADS), on this topic since they are required to authorize the use of chlorine in villages, but have not initiated a program to train individuals ; maintain a chlorine bank;or monitor the use of chlorine. We are presently in discussion with them to "push" them along to begin this training and autorization of chlorine use. As usual funding at this level is a problem for new programs. The ADS is also considering the implementation of a chlorine bank to make available the chlorine to trained village committees. In this case the villagers would be given the chlorine free since the ADS cannot sell items to the public. In summation we are actively working with the ADS to implement this program since we as an NGO are not autorized to do so without the ADS consent. This will take patience on our part and funding by the government to put in place. In the mean time the villages will have the chlorination device in place if they need it for an emergency health situation. As a result of our chlorine program we have several other village initiate contact with us to install these chlorinators on their existing water systems and we will do this as funds are available. We do include in all of our water projects training of individual households on the use of chlorine. You will see on page #5 of our application a poster we leave at each house that includes the basic health and hygiene topics; chlorine use; and a yearly calendar. This provides each house with a visual reminder of thes topics. Thanks Lynn for the explanation in detail. I have gone through all your past projects and seen the pictures. how do you get the pictures, by annual visits? is there any access of internet like at 15 km away at Nibaj? Most of the points that you have described is so similar to the area in India where we are implementing dugwells. In 2006 we made chlorination free of charge so that people get used to the chlorinated water. Following which at some communities people themselves would ask for the disinfectant ('medicine to kill germs' in their terms) and there are some communities those who still complaint about the chlorine smell where we are introducing earthen filters to remove the smell. Now majority of the communities (in Gaighata) are paying for the theoline and we are trying to establish to sell the bottles of theoline at the village market so that people can purchase as they purchase tooth powder or insecticide for thier crop. I can very much understand why this community cannot pay for the maintenance. There was a period, at our project, field workers visited every household in Kolsur area, every week and asked them to give one rupee (1USD=48 rupees). They gave the coin reluctantly for according to them water should be free and provided by the government and why we, NGO's, taking money from them. Still they don't pay for the chlorine and every year we say we should stop the treatment but we cannot. they don't care for chlorine at all. However this happens in one area only and there is plan to sign an agreement of discontinuing giving care by AWS, the local NGO, and in case of any incidence of diarheal disease from not using chlorine the implementers should not be blamed. All the best with your work and challenges you are facing. THANKS. High budget $62 per person. Maintenance of the system that uses pipes is vague. Need a proper set up to make the system sustainable. Progress reports of past projects are missing. Reports, pictures and statements of the prospective beneficiaries and users always give credibility. seems like a strong project. the cost to beneficiary is good. the amount of community contribution looks ambitious considering the prevalent poverty. people have ties to the land which will help drive positive results. Within the category of gravity systems I believe that the work done par Agua Para La Salud and directed by Lynn Roberts is very competent and seasoned. The issues that arte brought up and the solutions that are chosen are very similar to those we have learned about ourselves over the years. And financing the projects through Peer Water Review seem to me to be indicated in so far as I get the feeling financing for APLS comes hard as it does for us. This project that completes an earlier project should be supported. Would like to see the total cost of system to the population and see where the $/beneficiaries come out. The project is well designed with the active involvement and participation of the village community in the implementation and post project period. The gravity flow water supply system is appropriate solution and technology to provide drinking water in the remote and interior hilly area. The technology is simple, indigenous, eco-friendly, maintenance free easy and easily accepted by the village community. The village community is in need and deserves the support for rehabilitation to solve the drinking water problem, as they are totally displaced and have lost their assets during the civil war. Though per person cost is very high but considering the situation, felt need of the people, anticipating the benefits to more households and population in future - we strongly recommend the project for the PWX.